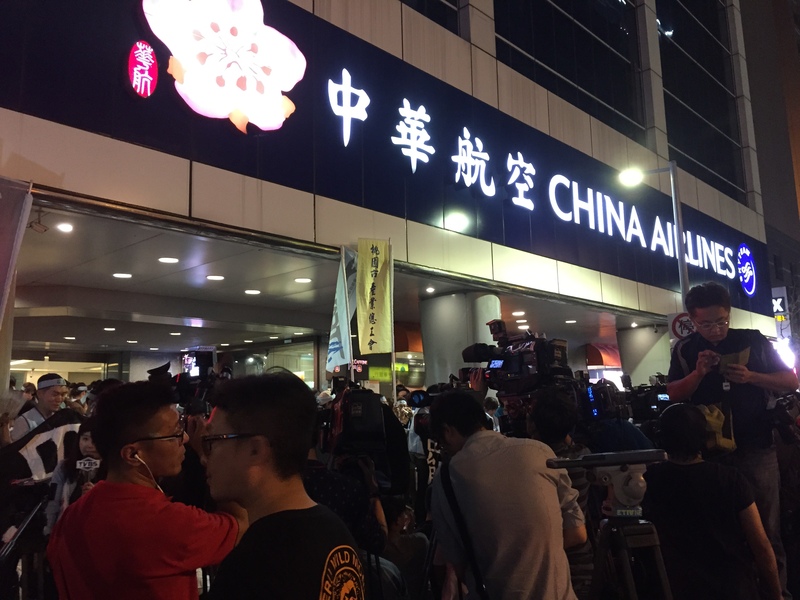 LABOR ISSUES continue to be contested in China Airlines, with the declaration of a strike over the Lunar New Year’s holiday by the Taoyuan Pilot’s Union at 6 AM this morning. Despite its name, China Airlines is a Taiwanese airline carrier, not to be confused with the Chinese airline carrier, Air China. The Lunar New Year holiday lasts until Sunday, but the strike is slated to continue indefinitely until strikers’ demands are met. Over 900 pilots are striking, leading to the cancellation of 26 flights, and affecting over 4,000 passengers. Airline management, however, claims that this affects less than 10% of current flights. 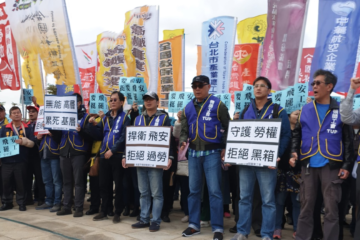 On the other hand, Taoyuan Pilot’s Union members have stated that over 10% of those currently striking have turned in their flight licenses, as a sign of their refusal to fly during the strike. In an open letter by pilots, they apologized to affected passengers for striking but stated that they view striking as necessary in order to ensure passenger safety. Pilots are demanding improvements to rest hours, calling attention to how they are currently made to work overtime in a manner that affects their work in a manner dangerously. Pilots are also critical of what they claim to be understaffing in China Airlines, citing past incidents in which pilots have passed out while on the job because of exhaustion. As such, pilots call for four pilots to be assigned to flights lasting over twelve hours instead of three pilots, as is currently done, and for three pilots to be assigned to flights over eight hours, instead of the current two pilots assigned for such flights. Moreover, pilots are demanding protection for their rights to unionize, citing past incidents in which union representatives were targeted by the company, or in which the company has sought to depict union members as “greedy” and simply wanting more money. Indeed, with the possibility of a strike by the Taoyuan Pilot’s Union over the Lunar New Year holiday looming over past weeks, this led to China Airlines corporate management calling up pilots and directly asking if they were union members. Likewise, pilots call for first hiring local pilots before hiring foreign pilots, as well as greater autonomy, and being allowed to have a say in who is named as pilot management. Pilots also cite a corporate culture in which flight operations quality assurance is used to punish pilots instead of used to improve operations and call for the removal of certain senior staff members to change this. In order to make conditions in China Airlines comparable with rival airline EVA, pilots also call for year-end bonuses equal to one month of pay, as is currently the standard for EVA. The Taoyuan Pilot’s Union also voted in favor of a strike in August, which would have affected both China Airlines and EVA. This strike was timed to coincide with the mid-Autumn festival, another holiday period that sees a great deal of travel in Taiwan. Union members have cited that management frequently attempts to ensure that pilots do not act on their right to strike before major holidays in a manner which they see as violating pilot’s rights. However, this strike did not take place after eventual agreements between the union and management. 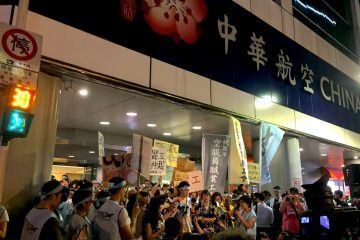 As China Airlines’ majority stakeholder is the Taiwanese government, it is possible that if members of the Taoyuan Pilot’s Union decide to strike, this would lead to direct intervention by the Ministry of Transportation and Communications (MOTC). As such, negotiations between union representatives and China Airlines’ management are scheduled to take place tomorrow at 3 PM in the MOTC building. Whether for pilots or other airline workers, conditions remain in dire need of improvement in Taiwan’s airline industry. Problems with internal culture can be observed in a number of recent incidents involving flight attendants, including an incident in which a flight attendant was made to clean up a male passenger who had defecated himself, and another incident in which a flight attendant was questioned over anonymous accusations that they had acted in a pornographic video posted online. Both incidents occurred regarding EVA Airways. 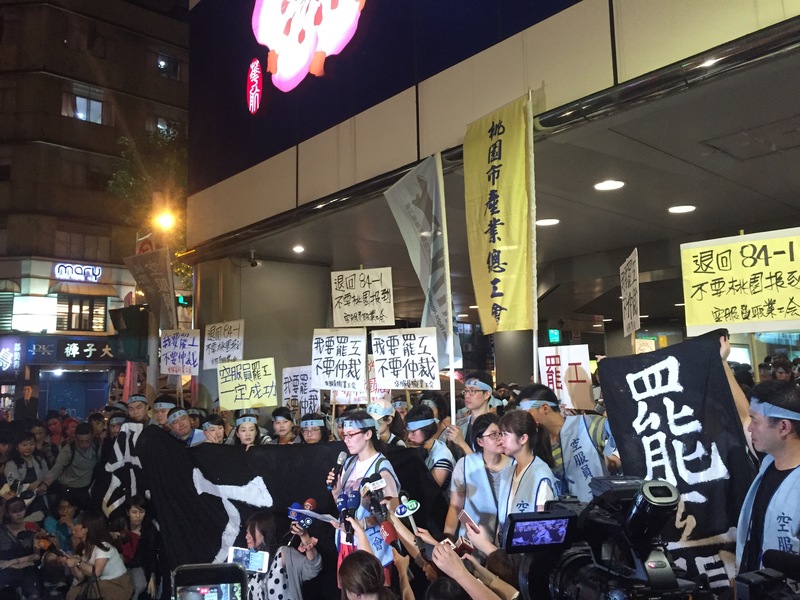 In general, the Taiwanese airline industry takes the view that it is justified in regulating the personal and private lives of workers and punishing workers in a demeaning manner for perceived transgressions. This also includes efforts by China Airlines and other airline companies to punish workers for organizing unions, sometimes red-baiting union organizers. More broadly, the issue of overtime has been long criticized in the Taiwanese airline industry. It is illegal for Taiwanese workers to be made to work more than twelve hours in a day, but the Taiwanese airline industry aligns with international standards which can mandate that airline workers work up to fourteen hours in a day. Unionization efforts for airline industry workers only took off within the last few years, because unions internal to airlines were controlled by management, rather than by workers themselves. 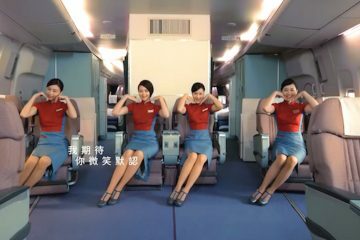 This only changed after the historic 2016 China Airlines flight attendant strike, which was led by the Taoyuan Flight Attendant’s Union, and which was the first strike in Taiwan’s airline industry. The Taoyuan Pilot’s Union is closely affiliated with the Taoyuan Flight Attendant’s Union. Like the Taoyuan Flight Attendant’s Union, it is a Taoyuan-based independent union which represents workers in more than one airline. 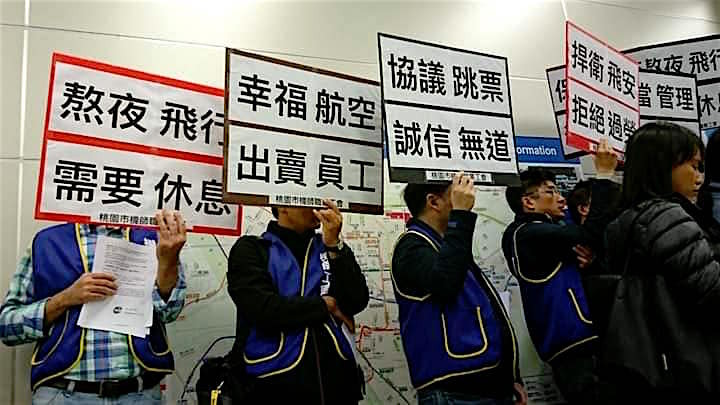 Both it and ground staff unions were in support of the 2016 strike by the Taoyuan Flight Attendant’s Union, considering also declaring a strike near the tail end of the flight attendant’s strike. 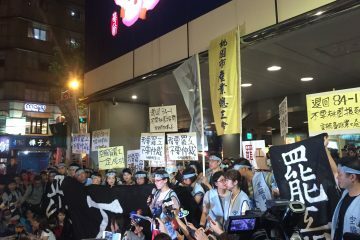 But either way, in the years since the China Airlines strike, the Taoyuan Pilot’s Union has been encouraged towards greater militancy, not only encouraged by the successes of the Taoyuan Flight Attendant’s Union but also because of direct grassroots cooperation between both organizers from both unions. 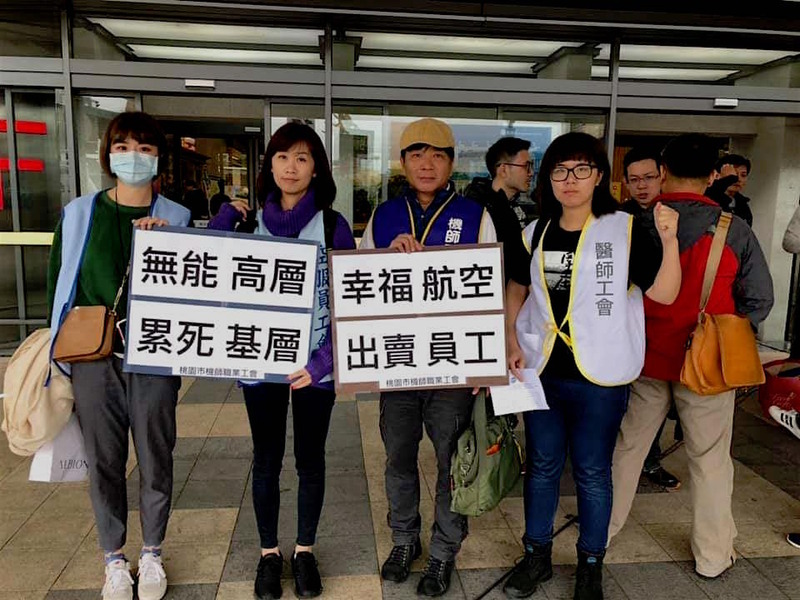 Indeed, much as how the Taoyuan Flight Attendant’s Union has served as a vehicle for flight attendants to stand up for themselves against corporate misbehavior, so too has the Taoyuan Pilot’s Union done the same for pilots. 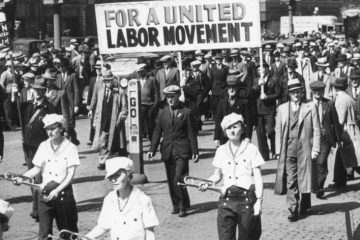 It is still to be seen whether ground staff will similarly organize to fight for their rights in the future, or whether increased labor militancy will spread to other airlines, such as EVA, whose flight attendants went on strike in January 2018, or to the transportation industry more broadly. 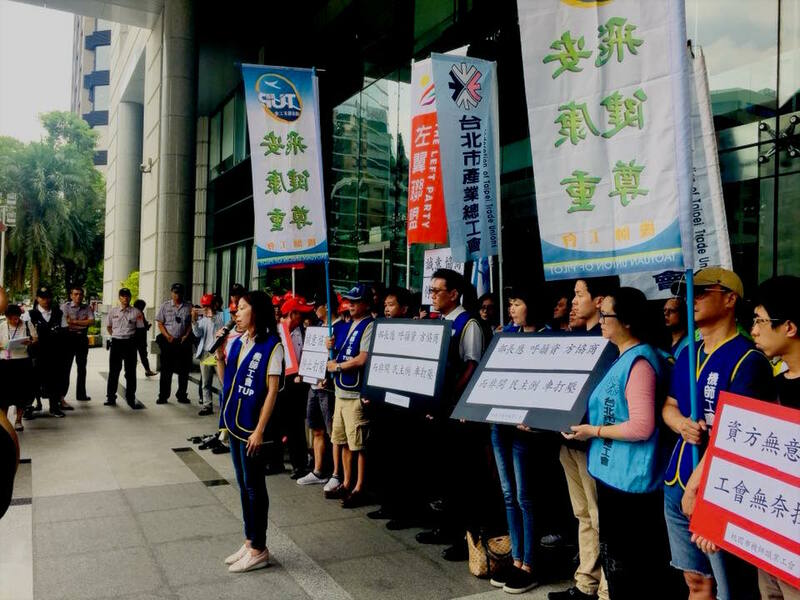 Unions in other industries, such as the Taipei Doctor’s Union, the National Taiwan University Hospital Union, the Tainan Confederation of Trade Unions, and the Kaohsiung Confederation of Trade Unions, have joined to express support for the current strike. If the end result of the strike is that direct government intervention takes place from the MOTC, this may have been the deliberate strategy of the union. 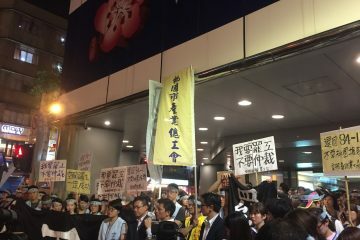 In past years, closely affiliated Taoyuan-based labor groups such as the Taoyuan Flight Attendant’s Union or the Taoyuan Confederation of Trade Unions—a key force in demonstrations against the Tsai administration’s changes to the Labor Standards Act in late 2017—have demonstrated a recurrent strategy of appealing to the central government to step in to resolve labor disputes. This may be no different with the current strike, but it is yet to be seen whether this will take place.